Overview: Horizontal pulls make a great complement to pull ups. They target virtually all the muscles of the upper and middle back, as well as the biceps and posterior deltoids. 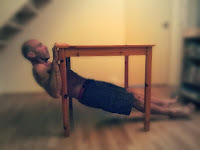 Notes: Horizontal pulls can be performed with a pull up bar, but a table can also make a simple alternative. On dip or parallel bars, they can also be performed with a parallel grip. About the progression: Horizontal pulls are usually trained as an easier alternative (and leading to) the pull up, but the progression can be followed in its own right. With the legs unsupported, horizontal pulls then combine the pulling motion with a front lever, thus working all the core muscles. 1. Vertical pulls (also known as door pulls, or let me ins). Place your feet on both sides of a vertical structure, grab hold of the structure on each side, and lean back. Keep your elbows close to your body as you pull, and squeeze your shoulders together on top of the movement. The closer your feet are to the object (or the further they are past it), the harder the exercise. You should breathe in as you lower yourself, and breathe out as you pull. 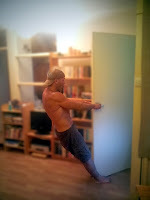 Same exercise performed while holding onto a door handle. 2. Vertical pulls with a towel. The towel allows you to get lower and makes the exercise harder. 3. Inverted rows legs bent. Performed on a low horizontal bar, with bent legs, feet resting on the floor. Lower yourself slowly over 3 seconds. Squeeze your shoulder blades together as you reach the top of the movement to engage your rhomboids. 4. Inverted rows, straight legs. Performed on a low horizontal bar, with straight legs, feet resting on the floor. These can also be performed on a set of dip bars such as the ones pictures here, sold by . With a broom resting on the back of two chairs. 5. Inverted rows, one leg extended. 6. Inverted rows legs elevated. 7. Inverted rows legs elevated, one leg extended. 8. Tuck knees, front lever rows. Suspended from a pull up bar, bring your knees under the bar and try to keep your upper body parallel to the floor. Then pull with your arms, bringing your chest towards the bar. 9. 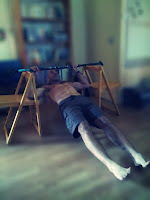 Avanced tuck knees, front lever rows. Bringing your knees in front of the pull up bar not only increases the leverage of the exercise, it also gets them out of the way, thus allowing for a greater range of motion. 10. One tuck knee, one leg extended, front lever rows. 11. Straddle legs front lever rows. The further apart your feet are (the wider your straddle) the easier this variation becomes. The same exercise can be performed on dip bars with a parallel grip. I'm having a bit of trouble going from Lvl. 7 to 8. Would a tucked dragon flag be a good progression to get there, since my pull up bar is a bit unstable for negative tucks. Not really... Tucked dragon flags will primarily work your core, whereas the aim of this progression is to engage your rhomboids, lats, and biceps. There is a fair amount of core work too, but this is covered by other progressions on this site. Most likely, if you find it hard to move from step 7 to step 8, your weakness is the pulling part. This will come in time as your pull ups improve. Thanks, I'll keep up with tucks and pull-ups untill I can get horizontal then. wow El you do know exactly what you talking about! awesome!! Is that a bar attached to a higher pull up bar? Could you do these with band hung off a pull up bar? I only have access to an outside pull up bar so finding it hard to figure out where to do inverted rows. 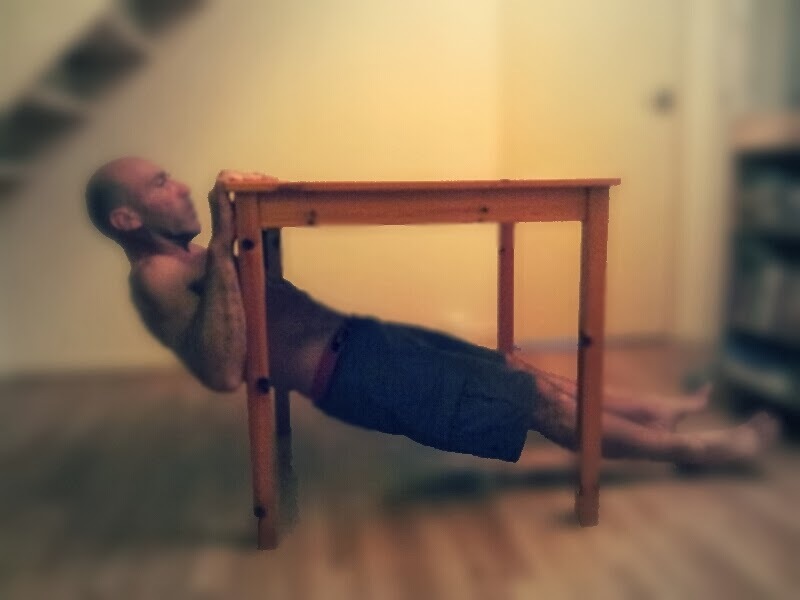 I don;t have a high kitchen table. Just a korean low one. It is a metal bard attached to the stairs on my staircase with two straps ( http://3.bp.blogspot.com/-1TaD0JV1vfI/UnDwyZ1Md3I/AAAAAAAABl0/oEFLA4adRCA/s1600/pull+up+bar+with+straps.jpg ). It's easy to make and really cheap. What I would advise though, if you are serious about bodyweight training, is to get gymnastic rings and straps: you can adjust the height, and do inverted rows on them, as well as all pull up variations, muscle ups, dips, levers, etc. They are amazingly versatile. Can I use this progression for me to gain the strength towards one arm inverted rows El Diablo? I've been trying to get my reps in Level 4 of Inverted Rows from 13 to 30. Do you know an effective way to accomplish this goal? Do you think I can exclude these from my workout? If both exercises work the same muscle, can I eliminate these for the sake of time? As much as you can eliminate pushups (horizontal pushing) because you're already doing dips (vertical pushing). Each exercise works a range of motion. They're helpful to have, but I wouldn't say they are necessary. I've removed horizontal rowing movement and holds from my routine, with the occasional "show off a front lever on a door frame" show... hehe. I've since replaced all barbell rowing/horizontal pulling with weighted wide grip chin-ups that I tilt far back on. They hit the posterior delts with ease. The further back you lean on a pull-up/chin-up, the more rear delt and rhomboid you will hit. Try it out, and let me know how it goes! In a similar vein, if I do not have a rope/towel or sturdy gym equipment, is it possible to substitute these with bent over barbell rows? In my gym I have access to dumbbells at 2.5kg increments and barbells(I'd be doing a barbell program if they had a squat rack). Should my elbows be tucked in or flay out on the pull up? When you say to "squeeze shoulders at the top of the movement" are you squeezing them together in front of you or your shoulder blades behind you? This question may seem silly but an answer would be much appreciated. Moving from 8 to 9, with my knees are now out of the way, should I aim to pull my chest all the way up to the bar? I am having a lot of trouble doing this. Hey man, first, awesome blog! I was doing cali before, but your guide is to the point and seem to be working to me, thx! Anyway, in the inverted rows the range of motion is from arms completely (or almost) extended to chest touching the bar (in the case of inverted rows)? Also, is it ok not to feel the biceps tired in this exercise? After doing 3 sets of 5 on the Inv. Rows (bent legs) I don't feel like they have been worked enough, but if I try one more repetition I end up with my form messed up. I can do another set of 5 after 2 min of rest though, but I'd rather keep my exercises short. Hi! For the 3 and 4 inverted rows, what sort of height should the bar be? For example, waist height, chest height? Thanks for the site, it's a nice resource.